In our daily web design work it happens often that we find a good free resource, for example a form or a beautiful animated button, and we immediately think to integrate it in one of our sites. Or it can happen that a client has purchased a premium template for his site and wants to add a login and a registration page. So you search on the web and find a really nice and free login form, you download it and are ready to integrate it in your client’s template. What happens oftentimes is that you find it difficult to integrate the form in your project, or it lacks support from the creator. This also happens with some of my free resources as you can see in some users’ comments on this site. In today’s tutorial we’ll do something very similar. 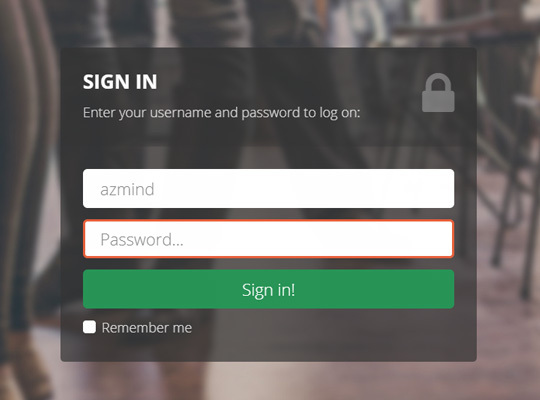 We’ll take a free login form here and integrate it in the Lancar Bootstrap template, to create a beautiful login page with fullscreen background. And if I see that the tutorial is useful to you, in the future I’ll do more of these tutorials for my other free forms and resources. or you can get the ready-to-use version included in the Lancar template and save some time. If you’ve chosen the first option, download these free login templates, extract the .zip package and choose one of the templates. Each one of them is placed in its own folder, named “form-1”, “form-2”, etc. I’d choose the first, but they’re similar. Open the “index.html” file inside the “form-1” folder with your favorite code editor. I use Eclipse. 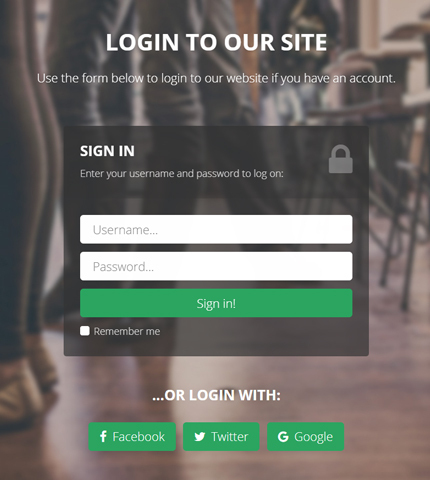 This is a free responsive login form made with Bootstrap. Download it on <a href="https://azmind.com"><strong>AZMIND</strong></a>, customize and use it as you like! Now create a new HTML page in your template’s folder. It must have the same header and footer as the rest of the template, and an empty body where we’ll add the login form. &copy; Lancar Bootstrap Template by <a href="https://azmind.com">Azmind</a>. As you can see, apart from changing some text, I’ve also changed some classes’ names in the HTML code, to make it more consistent and easier to read and work with, but the structure is the same. Depending on the template you are using, you might want to use your own classes. I encourage this, because I think experimenting by yourself will help you learn better. In this template I’m using Bootstrap v3.3.7. You can learn more about forms and their correct use from the Bootstrap documentation. And here you can learn more about the Bootstrap grid system, if you need. I’m also using some classes for the animation effects, like “wow”, “fadeIn”, “fadeInUp”. They are defined in the files “animate.css” and “wow.min.js”. This is a topic for another tutorial. First, we style the page container and the text, classes “login-page” and “login-text”. Second, we style the form’s parts / components, classes “l-form-top”, “l-form-top-left”, “l-form-top-right” and “l-form-bottom”. Third, we style the input fields, username and password, and the submit button. For the “Remember me” checkbox I’ve used the Awesome Bootstrap Checkbox CSS library, the file “awesome-bootstrap-checkbox.css” in “/assets/css/”. It is a pure CSS way to make checkboxes and radio inputs look prettier and add some style to them. I’ve used a few lines of code for styling the checkbox and making it match the overall look of the form. In the template I use some CSS media queries to make it responsive, so it looks good when viewed from different devices, desktop computers, smartphones, tablets, etc. The Bootstrap framework has its own media queries but, depending on the template or website I’m creating, I often need to add some other media queries to make the various page components responsive. In this case I’ve added them in the file “media-queries.css”, in “/assets/css/”. We do this in “scripts.js”, in “/assets/js/”. For the fullscreen background I’ve used the Backstretch jQuery plugin, defined in “jquery.backstretch.min.js”, in “/assets/js/”, and included in “index.html”. As you can see we check if the username or password input fields are empty. If so, we block the form submission and add the class “input-error” to the input field. That’s all! 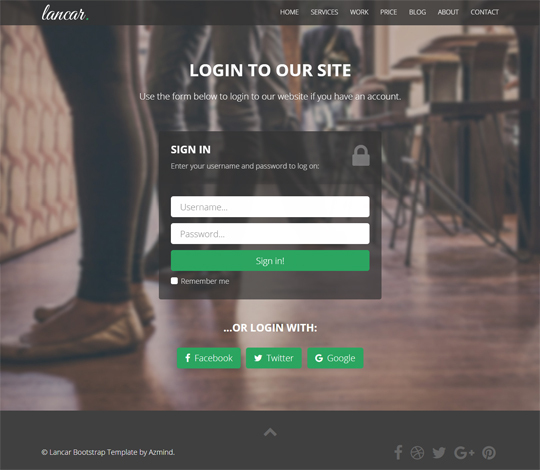 Here is again the DEMO and here you can get the Lancar template with this login page included, along with free support. Remember: this is the front-end part of the login page. Now you have to implement the back-end part to make it fully functional: user validation, session creation, etc., with your favorite platform and programming language. I might create another tutorial for this. So, I hope you liked this article. If you have any question or want to suggest a specific tutorial, let me know in the comments below.